Preheat the oven to 375 degrees. Place the pecans on a baking tray, add the butter chunks and pour the maple syrup on top. Toss. 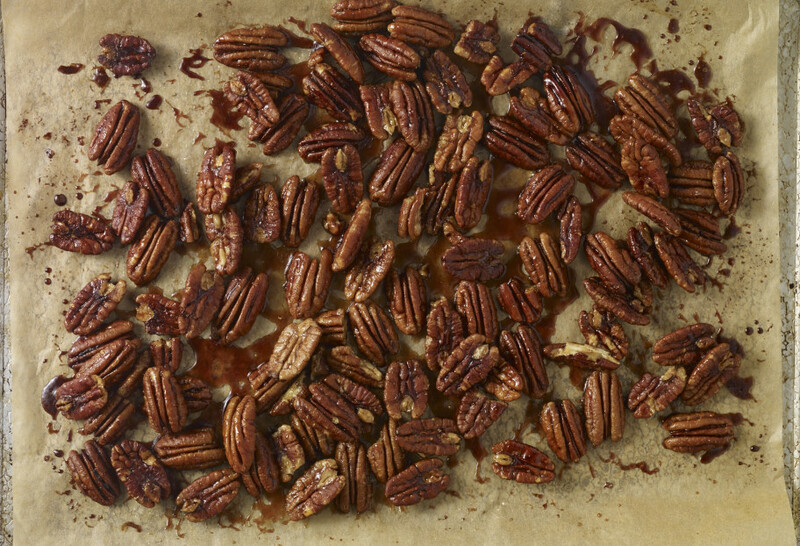 Bake for 10 minutes, take them out of the oven and stir to make sure all the pecans are covered with the syrup. Place them back in the oven for another 8 to 10 minutes, until they have browned and the syrup has thickened to the consistency of caramel. Take them out of the oven, scoop the pecans out and place on a dry surface such as a kitchen counter or another baking tray. Try to separate the nuts from each other. Once completely cool, they can be stored in a closed container for weeks.